The gods of West African myth get cut down to Sizes in Tarell Alvin McCraney’s taut, expressive drama, which resituates figures from Yoruba legend in the rough bayous of modern Louisiana. Ogun Size (Owuor) is a reliable, industrious auto mechanic (as befits his namesake deity, the god of iron and labor); his more free-spirited and trouble-prone younger brother, Oshoosi Size (Henry), has recently been sprung from prison, but their bond may not be impervious to the trickstering of Oshoosi’s erstwhile jailmate, Elegba (Villar). In Tea Alagic’s lean, ritualistic staging, the Size home really is a family circle: a ring of white sand with a pile of rocks at its center, like a cell of brotherly love. Although the plot is unremarkable, McCraney’s writing can be arresting, and the performances—accompanied by a percussionist stationed just off the thrust stage—are direct and effective. (Having ridden this vehicle from Yale School of Drama through the Under the Radar festival earlier this year and now to this run at the Public, the actors know how to navigate the play’s alternations of bluntness and lyricism.) 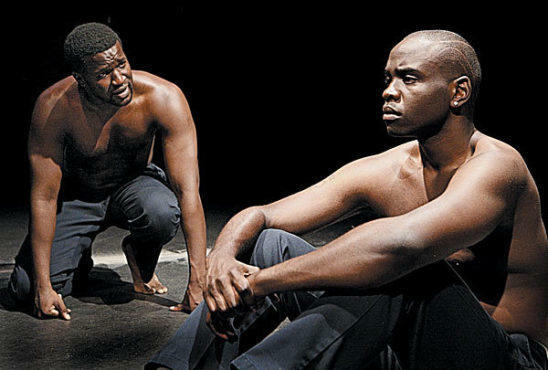 Unpretentiously, The Brothers Size realizes the potential of theater to elevate the ordinary. Public Theater. By Tarell Alvin McCraney. Dir. Tea Alagic. With Gilbert Owuor, Brian Tyree Henry, Elliot Villar. 1hr 30mins. No intermission.